As the holiday season draws nearer, the best thing you can gift yourself in preparation for all those sweets and a Holiday feast is excellent oral hygiene. The more you keep putting off that appointment or dental procedure, the more you endanger your oral health and your wallet too. When it comes to your dental insurance benefits, you need to use them as soon as possible, or else you risk losing what you worked so hard for. Whenever you’ve received dental insurance benefits from your employer, it’s important to remember that they aren’t as long-lasting as you think. In contrast to medical insurance, dental insurance provides you with a specific dollar amount to spend on your care each year. But remember, you need to book your appointments and get your procedures completed before December 31. By maximizing dental insurance coverage in the current year, you can use next year’s benefits for any unexpected procedures that may need to be done. Most plans reset in January, meaning you will have to pay the full annual insurance deductible before your insurance company gives the okay to issue benefits. Why let all these perks go to waste and make your teeth suffer? Many dental insurance plans provide coverage for everything from routine checkups to more complicated treatments. Various dental insurance plans will include coverage for two checkups every six months to ensure your gums are in good shape and plaque isn’t staking it’s claim on your teeth. If you need a procedure that will require multiple visits, the end of the year is an ideal time to visit your dentist. That is especially true if you haven’t met your deductible or hit your annual maximum. You can start a procedure in 2018 and return for your follow-up visits in 2019, using your renewed benefits. One way to ensure you maximize your dental insurance benefits is through opening a flexible spending account (FSA). Though these accounts also expire annually on December 31, these accounts allow you to obtain reimbursement for medical expenses (including dental work). Plus, they are tax-exempt savings accounts. Employment and federal income taxes are not deducted from contributions to the account. Anything that prevents or treats a dental disease is eligible for FSA coverage, including cleaning, fillings, sealants, crowns, tooth extractions, preventative services, and more. Using an FSA allows you to accurately review your expenses while also presenting you with opportunities to get extra dental work done when necessary. You can save more money on that crown you need, those dentures you ought to get, or even on orthodontics. Products such as denture cleaners, adhesives, and toothache relievers are covered by a flexible spending account too. Some orthodontics and dental products such as toothbrushes and floss, however, are not covered. 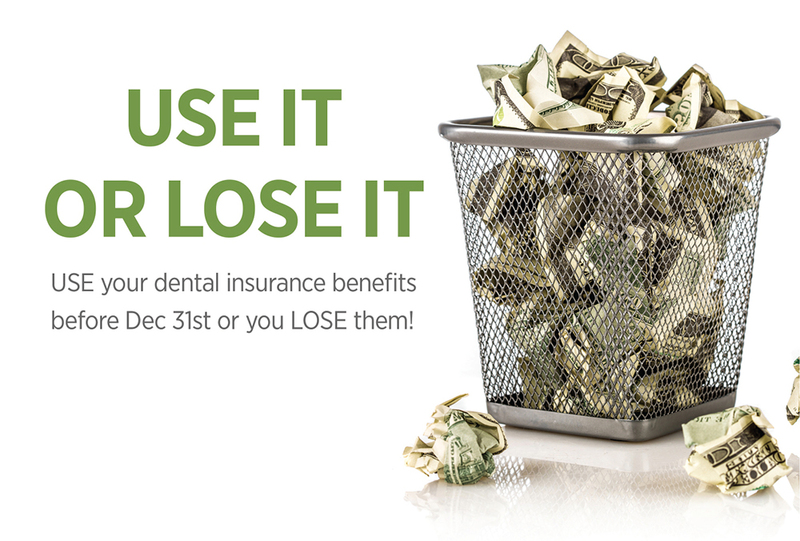 Start taking advantage of your remaining dental insurance benefits before the year ends. Get your next cleaning or dental procedure done at Thomas L. Anderson, DDS and Associates right away! Contact us immediately or schedule your appointment to meet with any of our skilled dentists at one of our three conveniently located dental office locations within the Kansas City area, including Lee’s Summit / Independence, the Country Club Plaza and Downtown Kansas City. The gentle dentists and expert team at Thomas L. Anderson and Associates look forward to working with you to treat your dental emergency, achieve proper oral health and a beautiful smile that will last a lifetime. If you have any questions about your dental insurance benefits, please do not hesitate to contact us. We are happy to review your policy! Please give us a call today to schedule an appointment and become part of our dental family.